Internal Awareness - Water or Coke? For every ounce of soda, (all sodas) it takes 32 ounces of water to dilute the acid in that soda. Cancer thrives in an acidic body, but it can not live in an alkaline body. Drinking 5 glasses of water daily decreases the risk of colon cancer by 45%, plus it can slash the risk of breast cancer by 79%, and one is 50%less likely to develop bladder cancer. The world's first soft drink disguise as a multi-purpose cleaner? Or should it be a multi-purpose cleaner disguise as a soft drink!!! Besides that, If you pour Coke (yes, the soda) on a slab of pork, wait a little while, you will SEE WORMS crawl out of it. The average pH of soft drinks, e.g. Coke, Pepsi is pH 3.4. This acidity is strong enough to dissolve teeth and bones! Our human body stops building bones at around the age of 30. After that it'll be dissolving about 8-18% of the bones each year through the urine, depending on the acidity of the food intake (acidity does not depend on the taste of the food, but on the ratio of potassium / calcium / magnesium / etc. to phosphorus). 2)Pour a can of Coca-Cola into the toilet bowl. No scrubbing, no sweat - guaranteed. Rub the bumper with a crumpled-up piece of aluminum foils dipped in Coca-Cola. Much economical than the stuff from Smart Shop. 7) Empty a can of Coke into a load of greasy clothes, add detergent, and run through a regular cycle. 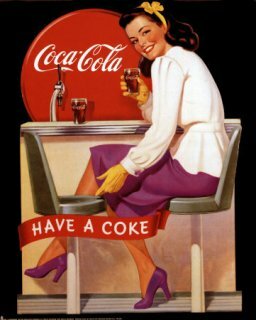 8) The Coca-Cola will help loosen grease stains. It will also clean road haze from your windshield. All the dissolved calcium compounds accumulate in the arteries, veins, skin tissue, and organs. This affects the functioning of the kidney (kidney stones). Soft drinks do not have any nutritional value (in terms of vitamins and minerals). They have higher sugar content, higher acidity, and more additives such as preservatives and colourings. Some people like to take cold soft drinks after each meal, guess what's the impact? Our body has an optimum temperature of 37 degrees for the functioning of digestive enzymes. The temperature of cold soft drinks is much less than 37, sometimes quite close to 0. This will lower the effectiveness of the enzymes and put stress on the digestive system, digesting less food. In fact the food gets fermented. The fermented food produce bad smelling gases, decays and forms toxins, which are absorbed in the intestines, get circulated in the blood and is delivered to the whole body. This spread of toxins can lead to the development of various diseases. Think before you drink Coke or Pepsi or any another soft drinks. Have you ever thought what you drink when you drink an aerated drink? You gulp down carbon dioxide, something that no sane person in the world would advise you to do. Few months ago, there was a competition in Delhi University "Who can drink the most Coke?". The winner drank 8 bottles and died on the spot because too much carbon dioxide in the blood and not enough oxygen. From then on, the principal banned all soft drinks from the university canteen.